Last week was Autodesk University, Autodesk’s annual software conference for 9,000 engineers, designers, architects, and artists. It’s an amazing event, focused on making of all kinds, but this year there was something new: a student hack! We joined Autodesk, which in collaboration with Makerversity, created Hacking AU: Designing for the Extremes. This multi-day, collaborative event had middle school students from the i.am.angel Foundation design solutions for real-world problems in three areas: Space, Land, and Sea. OMC was on hand with an Othermill to help fabricate and test the students' designs. After digging deep into the problems, the students brainstormed solutions and prototyped designs by hand in foam. 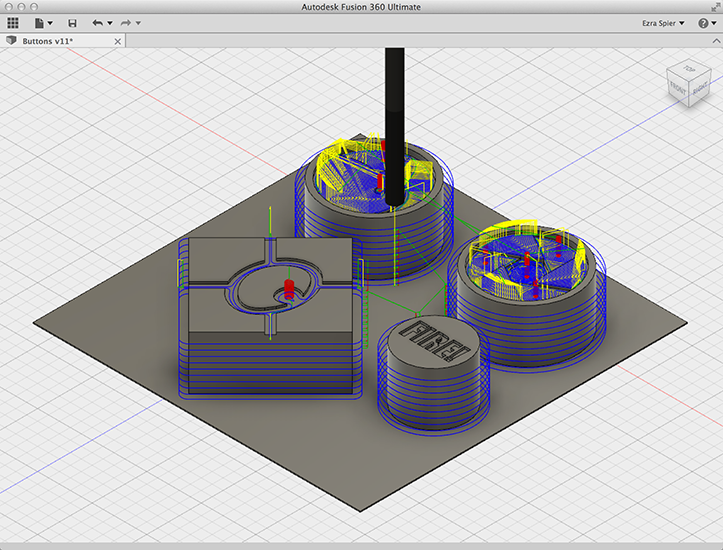 Then, with feedback from mentors, students worked with Fusion 360 to create CAD models of their designs. Finally, they used laser cutters, 3D printers, and, of course, the Othermill, to build prototypes. We used the Othermill and Fusion 360 CAM software to mill the buttons on this prototype remote control out of machining wax. It was fantastic to be part of this educational experience. In a short amount of time, they brainstormed, designed, prototyped, and iterated — we were impressed! Special thanks to Autodesk for inviting us to participate and to Makerversity for leading the event!